holidays – What's Cookin' @ Special Collections?! ‘Tis the Season…For a Number of Holidays! Southern Holidays: A Savor the South Cookbook, Debbie Moose, 2014. Moose offers a twist on traditional latkes–her version is made with sweet potatoes, a Southern staple. In the Christmas section, Moose shares another potato-based dish: Moravian Sugar Cake. The history of some ingredients in ambrosia might surprise you–many have connections to aspects of African American food traditions, including many of the fruits in this classic. This page includes Christmas recipes, several of which rely on persimmons and pomegranates. Wassail is one of those recipes with a LOT of variation. This one includes a lot of steps to make it from scratch, but there are simplified variations out there, too, if you’d like to do a little less work. This publication puts eggnog under New Year’s, but plenty of people enjoy it all fall/winter long. Here are a three varieties, including one that has another holiday classic: cranberry! Hard to believe it’s almost 2015! Hopefully, our readers out there have a fun way to ring in the new year. If you’re having guests and are still looking for the right drink to fill your punch bowl, we wanted to offer a selection or two of the bubbly. Here’s How: Mixed Drinks is a 1941 book published in Asheville, NC. It’s got some rather interesting wood boards (which make it hard to scan, so apologies for the slightly off-kilter images–I haven’t been into the bowl yet!). Plus, there are more than a few punches. Cheers to your 2014 AND 2015! Special Collections (and the university at large) re-opens next week. Be sure to stay with us–we’ll have plenty of new surprises in store! 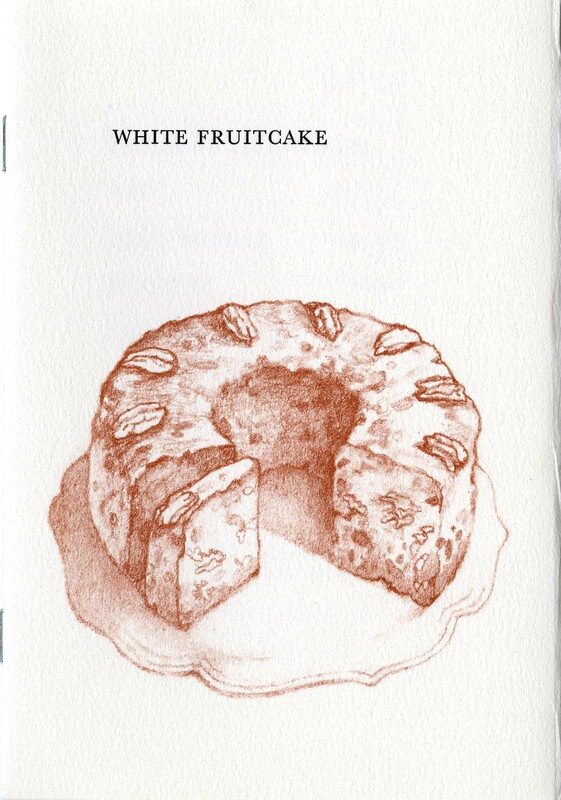 In 1980, Albondocani Press produced a Christmas card with Eudora Welty’s White Fruitcake recipe. The cover art, by Robert Dunn, was an hand drawn image that actually looks quite appealing! We have one New Year’s Eve post scheduled, then we’ll be back in 2014. We look forward to continuing to share our collection with you. Happy Holidays from Virginia Tech Special Collections!